Prefects got a good draw against Star, who recently won the Excelsior Cup. The first eight games were won in straight sets. Michael Hahn had comfortable wins against Iain Martin and Andy Ferguson and Justin had a similarly straightforward win against Andy. Clyde lost in straight sets to Iain, and John Hannah outplayed all three Prefects player on this occasion. In the doubles, Michael and Clyde were unfortunate not to win a set but lost 3-0 to John and Iain. In the penultimate game, Justin edged past Iain in an excellent five-set game, with only one of the sets being won by more than a two-point margin. Clyde then levelled the match at 5-5 with a 3-1 win over Andy. New Kids also drew in their game against Lundin Lasers, although the individual games were much closer than Prefects’, with only two games being won in straight sets. Roman Nydza was undefeated for Lundin Lasers, beating Howard Lee and Ian Smith 3-1 and Kong Wan 3-0. Howard and Ian won their other two games each, against Ron Filsell and Arthur Duncan, and combined to win the doubles against Ron and Roman. Swots did not fare as well against Viscounts, as they lost 10-0. However, many of the games were close, and the Swots trio of Dave Beveridge, Emma Bissett, and Chris Wroniecki all lost to Filip Jovanovic in five-set games, Chris being the closest to winning, losing 12-10 in the decider. Truants also had a tough time, losing 9-1 to Villa. Graham Wood got Truant’s win, 3-1 against Sandy Bertie. Graham was beaten comfortably by David Hay and was unfortunate to lose to Ian McLagan in a deciding set. Alain Leger and Knut Radmer lost all three of their singles games 3-0, but Alain and Graham were very unlucky not to win the doubles. They were 2-1 and 10-6 down but came back to win that set and were just edged out 13-11 in the fifth set. Prospects were the only winners this week, beating Telsports 7-3. 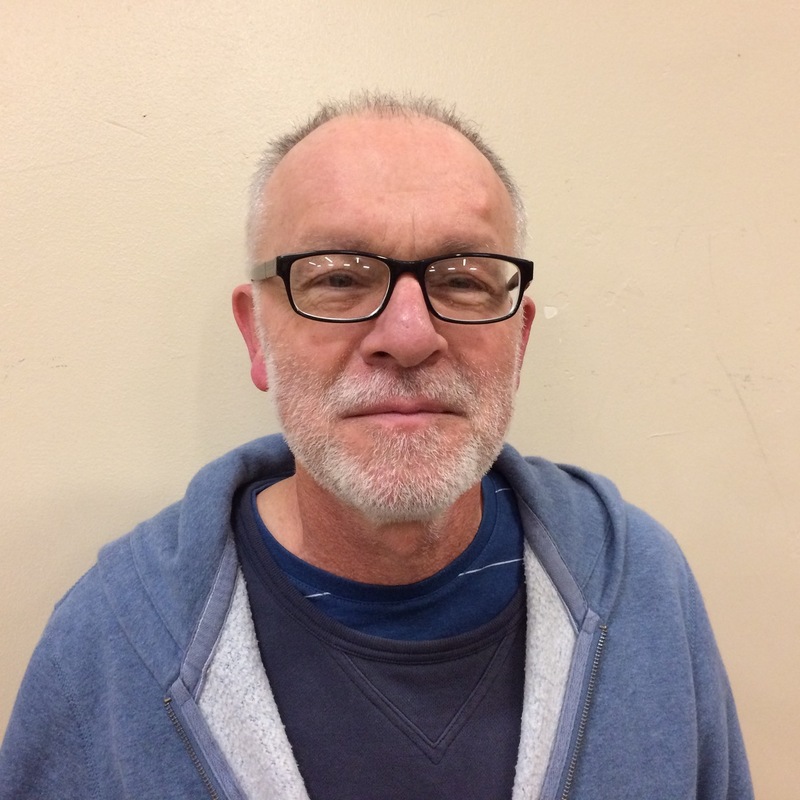 Ken Falconer did well to win his three games, recovering from 2-1 down to beat David Axton and winning 3-0 against both Paul McDade and Anthony Keeling. Chris Wroniecki beat Paul and Anthony but lost out to David, and Neil Lea got a good win against Anthony. Chris and Neil managed a strong 3-1 win against Paul and Anthony in the doubles. 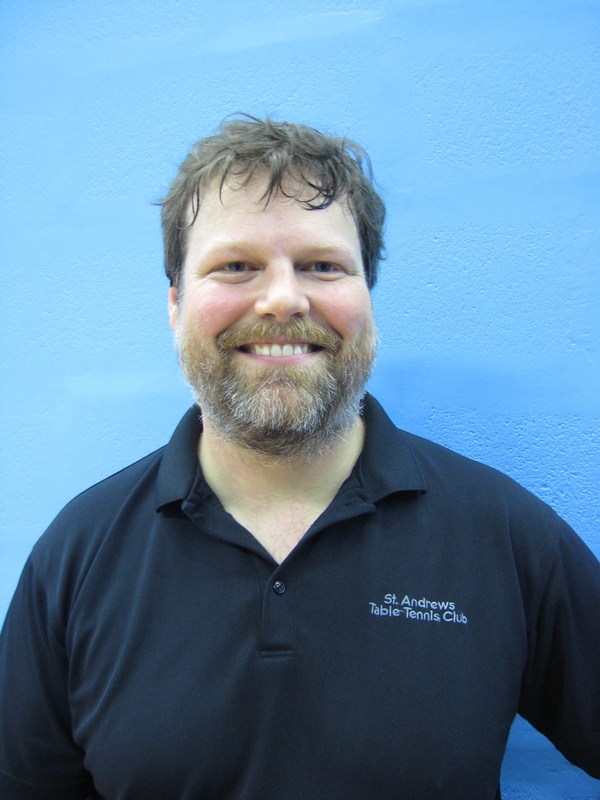 This entry was posted in Match reports, St Andrews Table Tennis Club on February 27, 2018 by standrewstt. Prefects were the first St Andrews’ team playing this week in the Dundee and District Table Tennis League, being beaten 8-2 by Up4It. Michael Hahn managed convincing 3-1 wins against both Paul Monteith and Ryan Docherty in the first and last games of the fixture, but Up4It won all of the other games. Howard Lee, who stood in for an ill Justin Yang at the very last minute, did well to get a set against Paul but found the opposition too strong. Clyde Johnson was defeated 3-1 by Ryan and 3-0 by Paul, despite two deuce sets, and played well against Scottish International Gillian Edwards despite the 3-0 scoreline, being unfortunate to lose the second set 17-15. After two epic encounters earlier this season, Michael would have been hopeful to beat Gillian but, despite a good performance by both players, Gillian was stronger on the important points, winning 3-0. The highlight of the night was the doubles game, with many excellent rallies; Gillian and Ryan eventually beating Michael and Clyde 16-14 in the fourth set. New Kids suffered a surprising 10-0 loss to Tigers. However, only two of the ten games played were won in straight sets so it could have been much closer. Particularly unfortunate were Ian Smith against Kenny McLaren, and Howard Lee against Scott Thomson, who were beaten 11-8 and 11-9 in the fifth sets, respectively. Truants managed the only win this week for St Andrews. Without Sascha Roschy, it was a much closer match than expected, beating Rollercoasters 6-4. Truants raced to a 4-0 lead as Alain Leger beat Tony Cook, Knut Radmer beat David Lane, and Graham Wood beat Paul Jackson and Tony. David scored the first point for Rollercoasters in a close encounter with Alain, winning 11-8, then Paul beat Knut 3-1 to reduce the deficit to 4-2. 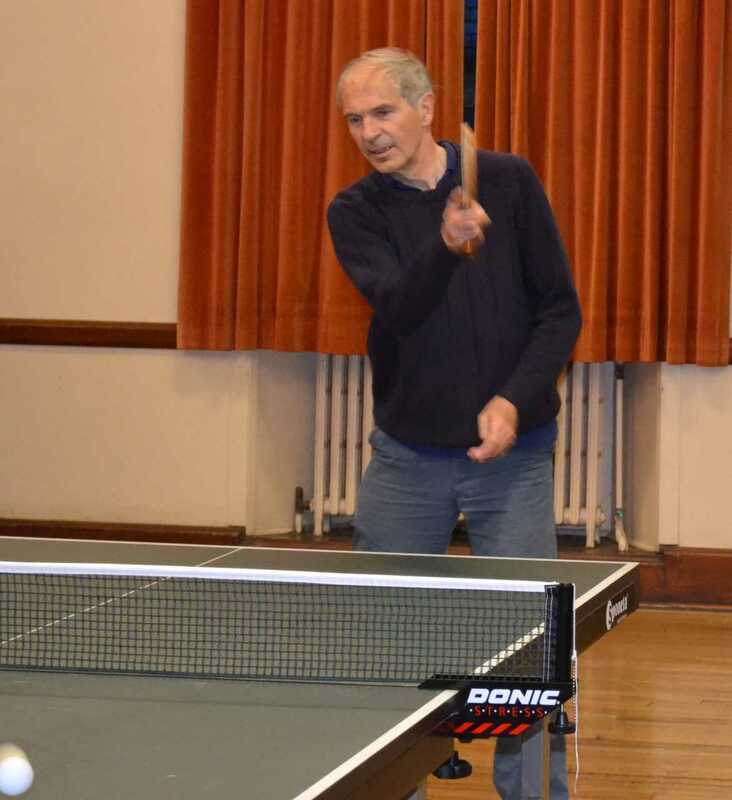 Alain and Graham halted their progress with a 3-1 win in the doubles against Paul and David before Graham closed out the win for Truants with a 3-2 win against David. Tony and Paul did gain some consolation for Rollercoasters as they beat Knut and Alain in the last two games to finish the night 6-4. 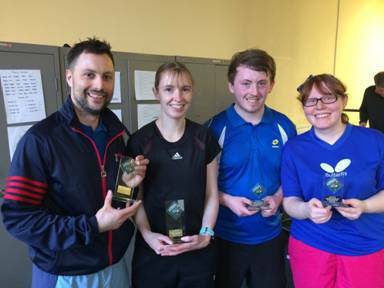 The Dundee Championships were held on Saturday 17th February, with several St Andrews players being involved. Emma Bissett did well to be runner-up in both the women’s doubles (with Carol McLean) and the mixed doubles (with Callum Riddoch). Dave Beveridge and Howard Lee also did well to be runners-up in the veteran’s doubles, and Dave was also runner-up alongside Stuart Halliday in the ballot doubles. This entry was posted in Match reports, St Andrews Table Tennis Club on February 20, 2018 by standrewstt. It was a quiet week for St Andrews teams, with only two teams playing cup fixtures. Truants faced Star, one of the leading Division One teams, in the Stanley Doubles Cup. Ian Martin and John Hannah—who currently leads the Division One averages—won a very comfortable opening game against Graham Wood and Alain Leger. Things look hopeful as Graham and Sascha Roschy defeated Iain and Andy Ferguson in five sets. However, the remaining games were all quite one-sided. Sascha and Alain won one set against John and Andy, but the Star pair won that and three other straight-sets games to take the fixture. However, Swots had a much better result in their Handicap Cup fixture against Tigers. Emma Bissett gave Swots a great start with a 2-0 win over Scott Thomson; Emma started 9-2 up in each set but the first set was particularly convincing for her at 21-7. From then on Swots always had the lead. Dave Beveridge lost the first set to Marion Davidson 21-15, but recovered to take the second 21-19. Collin Bleak furthered Swots’ lead when he came through in two close 21-18 sets against Kenny McLaren. Emma lost the first set to Marion 21-13 and then was pipped at the post 21-20 in the second set, but two more great wins for Collin against Scott gave Swots a 7-3 lead. Dave delivered two 21-17 wins against Kenny and Collin finished off the fixture with two comfortable wins against Marion. This win puts Swots into the quarter finals, where they will face Division One team Aces in the next few weeks. This entry was posted in Match reports, St Andrews Table Tennis Club on February 14, 2018 by standrewstt. Four St Andrews teams were in action this week in the Dundee and District Table Tennis League, with Prefects and Truants both winning fixtures against teams close to them in the league tables. Prefects won 8-2 against Kings, who were tied with them on points at the half-way stage. Prefects were helped by Kings only having two players, although the score-line would have likely been the same had they had a full team. The trio of Michael Hahn, Clyde Johnson, and Justin Yang all defeated Aleksandar Jovanovic, with Michael and Clyde dropping one set each and Justin winning 3-0. Adeola Fabola—Kings’ strongest player by a long way and Michael and Justin’s University of St Andrews teammate—managed to beat Clyde 3-0 and came through a close four-set game against Justin. However, Michael was too strong, beating Adeola 3-1. Michael and Clyde finished off the fixture with a 3-2 win in the doubles against Adeola and Aleksandar. Graham Wood who had two strong wins for Truants. Truants had a much tighter 6-4 win against Chieftains. Sascha Roschy reigned supreme, winning his three singles games for the loss of a single set, whilst Graham Wood also had a good night, winning two of his singles 3-1, but could not beat Jacob Munro, losing 3-0. Crucially, Sascha and Graham also won their doubles game against Fiona Kinloch and Jim Tawse 3-1. Alain Leger could not add to the score-line, losing 3-0 to Jacob and Jim, but was unfortunate not to beat Fiona, losing 11-8 in the deciding set, having led 2-1. However, New Kids found things much tougher in their match against Viscounts. Kong Wan started the night with a five-set game against Filip Jovanovic, losing out 11-8 in the final set. However, after that, every game for the rest of the night was 3-0. Kong also lost to Andy Hughes and Andrew Nimmo, and Ian Smith lost his three games. Howard Lee had two impressive wins against Andy and Filip, both 3-0, but lost in three comfortable sets against Andrew. Similarly, Prospects lost 7-3 to Lairds. However, given that they lost one five-set and four four-set games, it could have been much closer. Ian Brumwell and Dave Goddard were each beaten by the trio of Ewan MacDonald, William Beattie, and Ryan Connor, although Ian was particularly unfortunate to lose to Ryan, just being denied 13-11 in the deciding set. Fabio Sani put in a strong performance to beat both Ryan and William 3-0, but was soundly beaten by Ewan in the opening game of the night. Fabio and Ian were able to gain a further point for Prospects as they beat Ewan and William in five sets. This entry was posted in Match reports, St Andrews Table Tennis Club on February 6, 2018 by standrewstt.